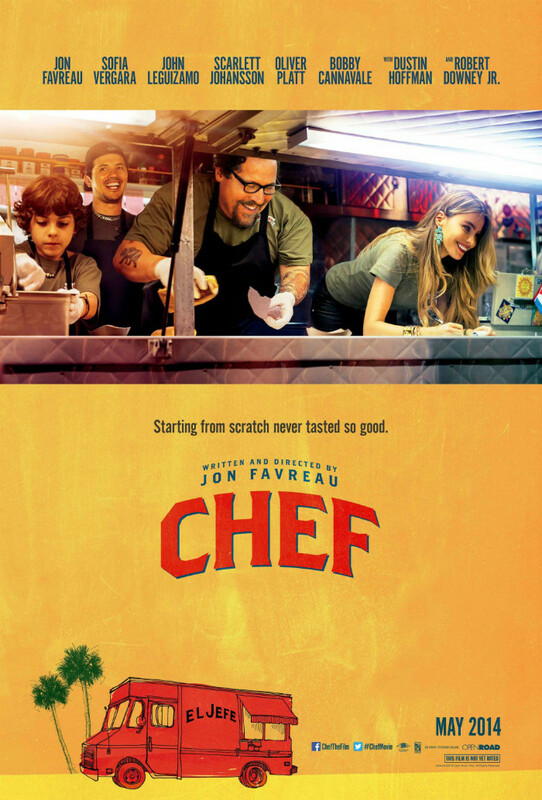 What’s cooking at the box office right now is “Chef,” the latest movie from writer/director Jon Favreau (“Made”) and his saucy return to his independent roots. Carl has been a hotshot chef at Riva’s for 10 years. Over this time he has become very successful, but also pretty comfortable, with the menu. He tried adding something new five years ago and nobody ordered it. His complacency is challenged when Ramsey Michel (Oliver Platt from “Fargo” the TV series), one of the country’s biggest food critics, comes to dinner. Carl wants to prepare some new and exciting dishes to impress Ramsey while Riva (Dustin Hoffman from “Meet the Fockers”) wants him to fix the same old grub. Like most guys, Carl has put everything into his career and it cost him his marriage to Inez (Sofia Vergara from “Modern Family“) and limited the time he can spend with his 10-year-old son, Percy (Emjay Anthony from “It’s Complicated”). This makes him a failure at everything, and thanks to the Internet, everybody knows it. When nobody will hire him, Carl reluctantly starts a food truck. He brings his son into the tiny metal kitchen that has become his refuge and the two finally get to know each other. Favreau has all the right ingredients in this story. Inez is not your typical ex-wife and the usual sub-plots you find in a movie like this were trimmed away. This is a small story about two big things: the passions of one’s life and the product of two people’s passions. They both are vital, and this movie says that balance is not the answer. They must be mixed together in a bowl and consumed daily to be fully satisfying and allow one to grow into the kind of human being they were meant to be.